그런데 진짜 솔직히 여기는 저희가 매운음식 챌린지에 도전하러 가봤던 곳들 중에 최애 맛집이었던것 같아요. 실제로 아드레날린이랑 엔돌핀이 솓구쳐서 희열에 빠질 정도로 매운 맛인데, 이름처럼 미치도록 맵지만 완전 맛있어요! 그리고 김치랑 치즈까지 그냥… 말이 필요없죠! 어쨌든 전 강추랍니다. 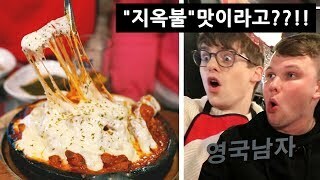 Today we go to try a beautiful cheesy spicy mountain of spicy cheesy kimchi pork ribs 😍 this is my kind of Spicy Korean food!!! (Is what I was thinking until the "Hell-Fire" spice level came out…. Honestly though this is definitely one of my favourite spicy challenges we've ever done. It's hot enough to actually make you delirious with adrenaline and endorphins, but it still actually tastes good! And the cheese and kimchi… Yup! Big recommendation from me. Deunggalbi Dalin, 25 Cheonhodaero 158-gil, Gangdong-gu, Seoul, ROK.